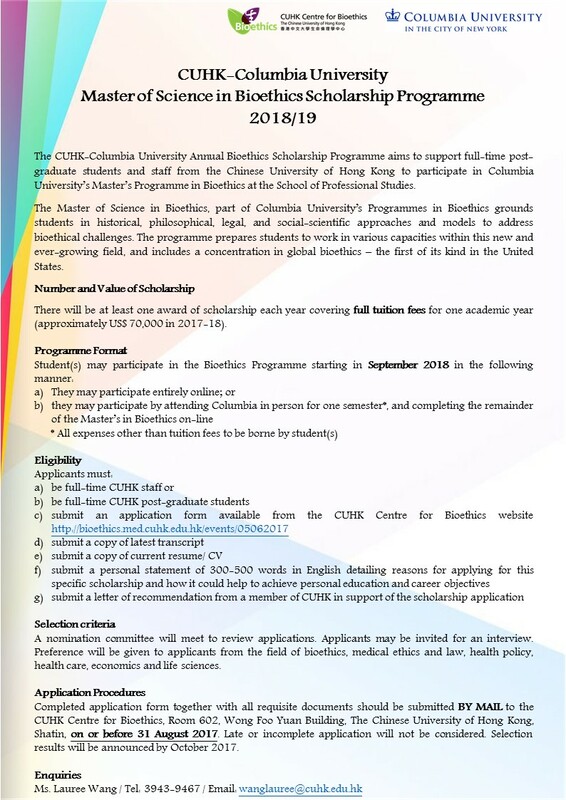 The CUHK-Columbia University Annual Bioethics Scholarship Programme aims to support full-time postgraduate students and staff from the Chinese University of Hong Kong to participate in Columbia University's Master's Programme in Bioethics at the School of Professional Studies. bioethical challenges. The programme prepares students to work in various capacities within this new and ever-growing field, and includes a concentration in global bioethics – the first of its kind in the United States. There will be at least one award of scholarship each year covering full tuition fees for one academic year (approximately US$ 70,000 in 2017-18). A nomination committee will meet to review applications. Applicants may be invited for an interview. Preference will be given to applicants from the field of bioethics, medical ethics and law, health policy, health care, economics and life sciences. Completed application form together with all requisite documents should be submitted BY MAIL to the CUHK Centre for Bioethics, Room 602, Wong Foo Yuan Building, The Chinese University of Hong Kong, Shatin, on or before 31 August 2017. Late or incomplete application will not be considered. Selection results will be announced by October 2017. Please read the flyer and Notes for Applicants carefully before starting the application!